Similarly, it is difficult to think of a masjid without a minaret or several of them. As it is well-known, the function of a minaret is to enable a muezzin to stand as high as possible before he issues the azaan or the call for worship. The higher he can stand, the greater the distance his voice or baang would carry and more would be the worshippers, who would attend the prayer. In the days where there were no loudspeakers, the height of the minaret was most crucial. An outstanding example of height is the masjid built by Aurangzeb on the banks of Ganga at Varanasi, which has two extremely tall minarets. Taking a foreign example, the big mosque at Istanbul was earlier a church of Hagia Sophia. There, the church was converted into a masjid by raising four minarets as tall as the pinnacle of the dome. In rural Anatolia and its wheat lands, most masjids have a single minaret. But a minaret was there nevertheless. Or else, the baang would not carry. Was the edifice Babri maqbara rather than a masjid? If so, why is the Sunni Personal Law Board making so much hue and cry about the structure and the land on which it stood? 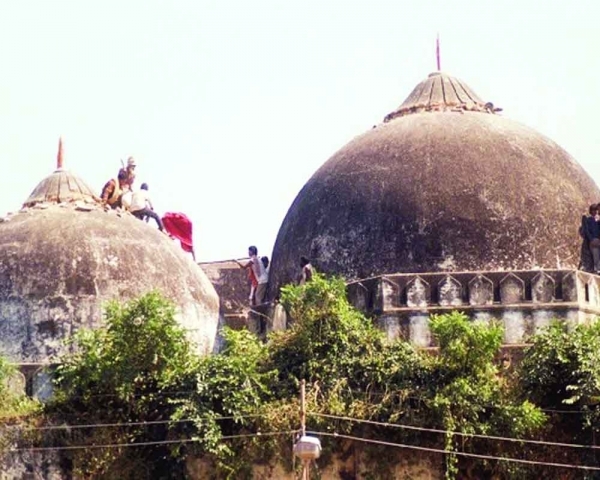 When this writer visited Ayodhya, he had heard a great deal about the Babri Masjid, as if it was some historic piece of architecture. This was early in 1991. The writer was surprised at the uncomely sight of this enormous rough-looking trinity of domes. More surprising was the total absence of anything like a minaret. This made him suspicious enough to enquire one by one, from three passing Muslim gentlemen, as to whether there was a mehrab or a mimbar inside, or a wuzooh for a wash before the prayer. A few minutes earlier, the writer was categorically informed by a skull cap-wearing gentleman that he could not go inside, hence the queries. Whoever the writer talked to, including two shopkeepers, referred to it as the ‘Babri’ Masjid. The writer had not earlier, or even later, come across a mosque named after any individual. His suspicion continued about the nature of the edifice in the absence of a minaret and the presence of the name Babri. On subsequent contemplation, the writer felt that perhaps, the edifice was a maqbara of Mir Baqi, one of the military commanders of Babar in the latter’s invasion of India. The date of the building has been consistently given as 1528 AD. Babar won the First Battle of Panipat in April 1526. He and his immediate men were new to India and were generally busy establishing their rule at Agra. How could Mir Baqi get the opportunity to visit Ayodhya; have the Ram temple demolished and have the huge Babri structure constructed — all in a matter of two years? In those days, five centuries ago, everything had to be done manually — breaking, building and all. It must have taken longer than two years. Babar died in 1530 while beseeching Allah, the merciful, to save the life of his ailing son Humayun. Taking all these circumstances, — the lack of minaret and the presence of the name Babri among others — could it be possible that Mir Baqi did not forget the King he was beholden to, and admiring of? He took his time to build this maqbarah, probably larger than any in India, as a compact building in the loving memory of Zaheeruddin Mohammad Babar. In short, was the edifice Babri maqbarah rather than a masjid? If so, why is the Sunni Personal Law Board making so much song and dance about the edifice and the land on which it stood? Up to a dozen of maqbarahs were demolished under the British rule in order to lay out Delhi’s Golf Course. Incidentally, Sir Arnold Toynbee had visited Delhi and Bombay in the 1950s to deliver the Azad Memorial Lectures. This was at the personal invitation of Jawaharlal Nehru. During the course of his lectures, Arnold expressed surprise at having seen the masjid with tall minarets, as we mentioned above, on the banks of the Ganga, still standing. This despite India’s independence, at the holiest of holy places of the Hindus. He went on to say that on his recent visit to Warsaw in Poland, he saw the cathedral in that city as a Roman Catholic edifice. When the Russians had conquered Warsaw a century or more ago, they had converted the earlier Catholic cathedral into a Russian orthodox church. The poles could not tolerate this but were helpless. When they regained independence towards the end of World War I, they demolished the Russian church and rebuilt their own. This pattern of behaviour was in evidence elsewhere too. Several wars were fought during the 1990s after the collapse of the Socialist Federated Republic of Yugoslavia, particularly the 1991-1995 war in Croatia and Bosnia-Herzegovina. This was the biggest conflict in Europe since the World War II, causing massive terror and brutality with approximately 150,000 deaths and several million people forcibly resettled. Although the Serbs, Croats and Bosnian Muslims, who fought this war, were Europeans of Slavonic ancestry, they had significant and irreconcilable differences in religion. The Serbs are eastern-orthodox Christians, the Croats were Roman Catholics, and the Bosnian Muslims are Slavs Islamised after the Turkish conquest. The Serbs have always defended Christian Europe from invaders, most notably the Ottoman Turks. The heroic Serbian defence in the Battle of Kosovo against the Ottoman invaders in 1389 AD stands out as a landmark. Conquering militias or armies in this 1992 inter-Yugoslav conflict destroyed the enemy’s religious symbols and built their own to symbolically mark the territory. For example, the capital city of what is today called the ‘Serb Republic’ of Bosnia and Herzegovina, was ethnically cleansed of all its numerous historic and newer mosques, with the Serbs also expelling the local Muslims, ostensibly in retribution for centuries of Ottoman humiliation. Not only that, the Orthodox Serbs destroyed about 200 Catholic churches in Krajina in Croatia during their four year occupation of the town. This was Serb revenge on atrocities against the orthodox Church by the Croat Nazi puppet state during World War II. The Catholic Croats had then murdered over a 100 orthodox priests and three bishops, massacred about 1,000 Serbs in a town Glina and also razed its orthodox Church of the nativity. Similar is the tale of Córdoba in Spain. It was originally a cathedral (Cathedral of Our Lady of the Assumption) but was conquered by the invading Moors and turned into a mosque in 784 AD by Abd al-Rahman. It was reconquered by 1236 AD by King Ferdinand III of Castile during the Reconquista. The centre of the mosque was converted into a Catholic cathedral. The kings who followed added further Christian features.